Lazarus Lake (or Gary Cantrell if you prefer) lit his cigarette and the jittery mass of ‘crazies’ trotted down the asphalt toward their foray into Frozen Head State Park. And so it began. Suddenly, without warning, one idiot dropped his water bottle and in cartoon-like fashion darted backwards against the flow of runners, narrowly avoiding collisions and pile-ups as the bottle was kicked to and fro across the road. That idiot was me. Thankfully I retrieved it safely and sprinted to catch up with my OCR buddy, David Mick, and some of his running mates. 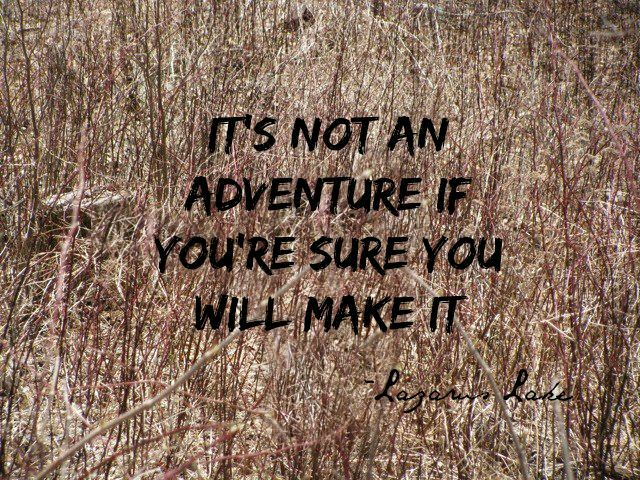 The adventure was back on and I learned few things along the way..
First. I had no clue what I was doing. Actually I knew that before I started. I am not an ultra runner. Heck, I’m not even a runner. I’m just an obstacle racer who was drawn to the allure of Barkley and the challenge it presented. I knew it was going to be HARD and probably in the company of some really cool people. I was right on both accounts. Second. I learned that a Barkley mile is not the same distance as a regular mile. Apparently a Barkley mile is approximately 20% longer. Sometimes. Or not. I will just say that you get more miles for your dollar at Barkley than at any other 50K. Third. Switchbacks up a mountain can go on and on and on and on. They can also go down the mountain and linger on and on and on and on. DOMS in the quads and hip flexors also lingers on and on and on. Fourth. 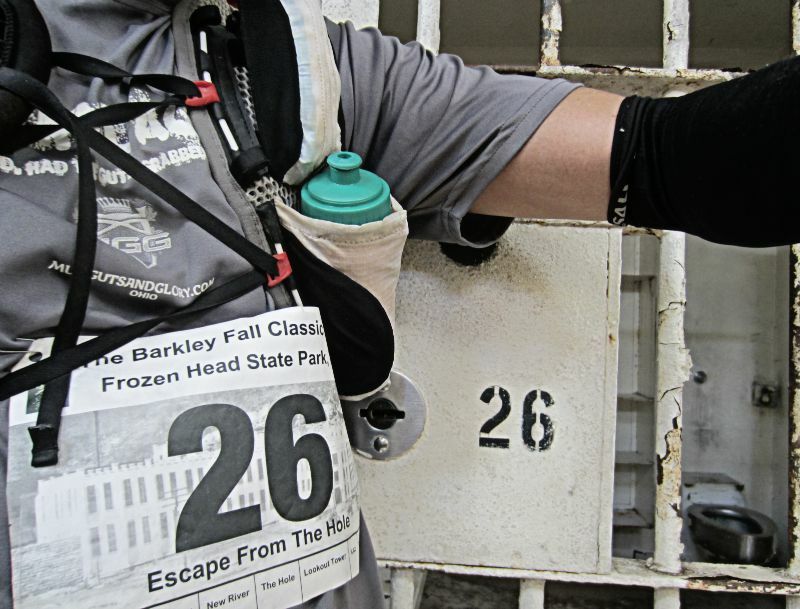 Racing through an old prison makes you glad you aren’t a permanent resident there. I discovered they had a cell waiting for me in Brushy Creek, but I was able to escape up Big Rat and Rat Jaw (barely). Fifth. Speaking of Big Rat and Rat Jaw...OH MY GOODNESS! Never have I encountered such a long and difficult climb in my life, a climb I thought would never end. Follow the power lines up the mountain. Get there however you can. Fight your way through saw briars and literal tunnels of 10 foot tall weeds. It hit me so hard that I had to break it down to “just go 5 feet to that tree and rest.” “Now just go 8 feet to that boulder and you can sit for awhile.” At one point I seriously contemplated lying down on a moss-covered boulder and taking a nap. The only thing stopping me was that I had a gnawing in the back of my mind that I needed to finish this race in the 13 hour and 20 minute time limit. By the time I found my way out of Rat Jaw I had resigned myself to the fact that I would not be able to make the cutoff and was trying to come to grips with a DNF. However, a few minutes later at the water tower checkpoint, I heard a volunteer say “You have 5 minutes to get to the next checkpoint before cut-off. It is a half mile. All downhill.” I found the energy to sprint that half mile, arrive exactly at the cutoff time, and find out that it was only a “soft” cutoff. However, I was warned that I was on the cusp of missing the next cut-off, which was hard as the Tennessee boulders. Four and a half miles later of quad-killing, knee-rattling downhill running Laz punched my bib with a little less than 10 minutes to spare. Six. I had a great time meeting different runners on the course; several of whom I passed and got passed by multiple times throughout the day. This event reminded me of the early days of obstacle racing when people did it just for the experience and nothing was on the line. Laz and Steve deserve credit for preserving the innocence of the Barkley events. Seven. I like trekking poles. I had a pair of black diamond z trekking poles at the drop bag on mile 22 and was extremely glad I did. Eight. There comes a point when you just want to be finished with that monster and no matter how painful it is, running is the only way to make that happen. Fortunately it is easier to run when you know the finish line is .7 miles away, just down the highway that you started on. Nine. Finishing to the claps and cheers of spectators and fellow racers is a really awesome feeling….even if it took you 12 hours and 45 minutes to get there. 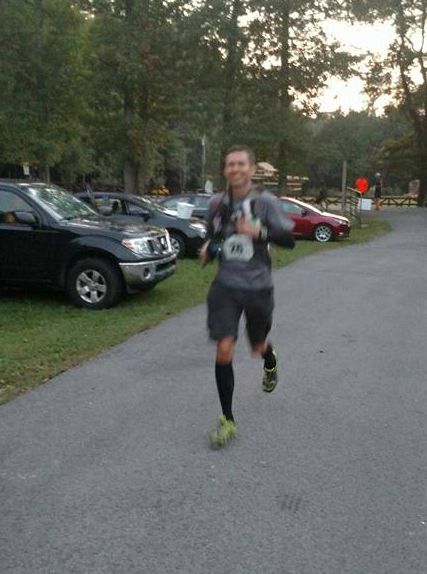 Fortunately, David was there and snapped a pic as I was nearing the finish. The photo does not accurately depict the pain in my knees and feet. Ten. There were multiple times during the race and for a couple of hours after when I swore this was a bucket list item – never to be attempted again. Now, I count it as one of my favorite racing experiences of all time and am ready to return. I think. 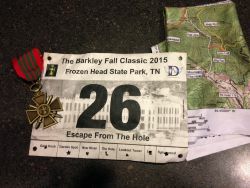 Previous Can I finish the 2015 Barkley Fall Classic? Man…sounds like you are an UltraRunner now…the slope is slippery to a 100 miler. Great report.